You may have noticed from some of the photos I’ve posted of Kimber that she’s naturally very furry. And it’s really cute, but she’s been struggling in the heat recently; yes, even in Scotland it can get too hot in the summer for furry puppies. Here she is, sheltering under a bush, while letting bunny swelter in the full glare of the fierce, Scottish sun! 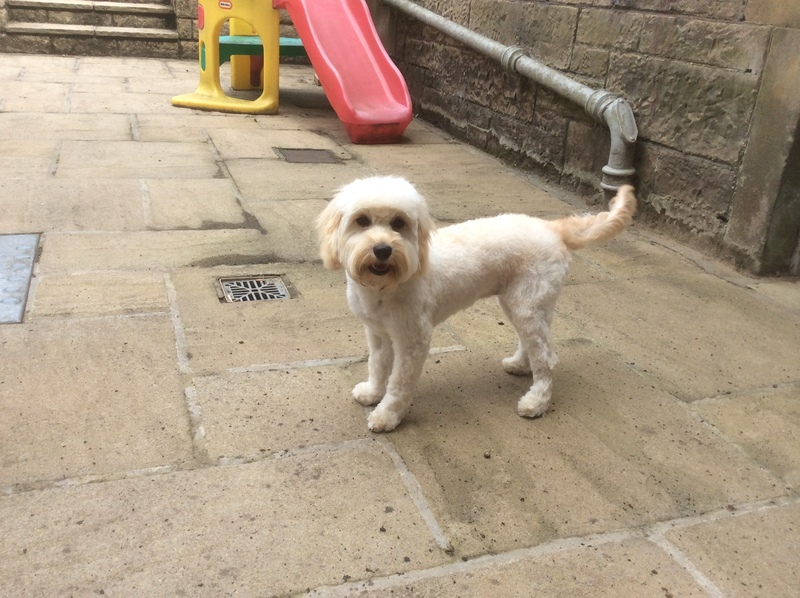 So on Monday I took her to Christine’s Grooming Parlour on Gorgie Road here in Edinburgh and left her in the capable hands of Emma. After a delicious lunch at my mums, I arrived back at Christine’s full of trepidation. What would she look like? Would I recognise her? 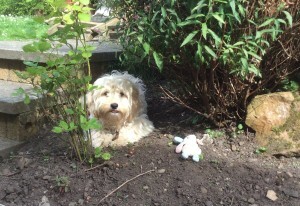 Well, I’m glad to say, that despite her looking like a lamb (Seamus reckons she’s channelling his look! Silly Seamus! ), she’s still our cute puppy! Whew! Here she is, modelling the very latest lamb look: a hairstyle that’s all the rage around Edinburgh at this time of year!